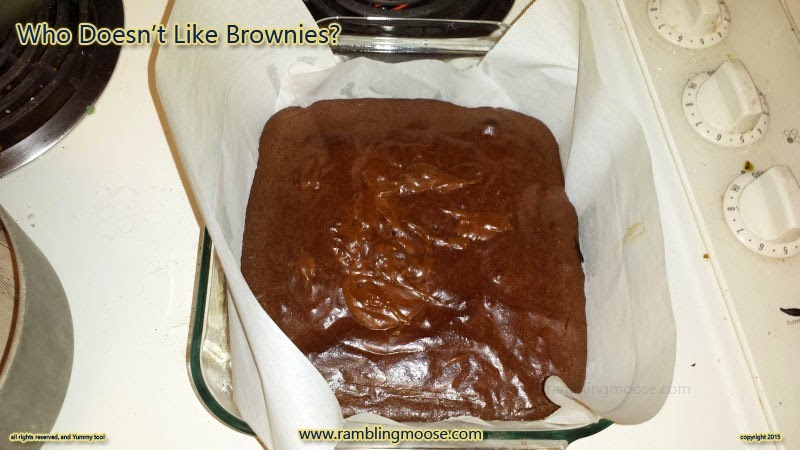 Rambling Moose: Fudge Brownies From Scratch - Of Course They're Easy! Fudge Brownies From Scratch - Of Course They're Easy! I know every time I go food shopping to make sure I'm "tanked up". You know, have a snack first? Never shop on an empty stomach, you just end up buying "crap". But... I was surfing on an empty stomach. I had hit that dreaded hungry zone an hour before a meal. Then this recipe showed up. It's a basic brownie recipe, and it looked really quite simple. Melt the ingredients. Bake the ingredients. Eat the ingredients, er, results. I did all that and I have to say, I will most definitely do it again. I did not add nuts last time and I want to try it with Pecans. Pecans are my Go-To nut when I'm baking anyway. They cook up soft, have more flavor than Walnuts, and don't overpower like Peanuts. If the timing is right, I'll toss in some mini marshmallows and make Rocky Road. My own personal history with baking brownies is long. There was a home-ec class we all had to take in 7th grade. Since I have a scientific mind, I took to the whole baking thing quickly. Baking is more like chemistry than cooking a roast is. If you get the proportions wrong, it turns out badly, and in some cases a recipe could be quite fussy. But this particular recipe? Simple. Literally toss the stuff into a bowl and warm it. It can be done in the microwave, but I suggest a Bain Marie or Double Boiler. It's a wee bit more trouble but worth it. Just a bowl floating on top of some simmering water and you get the right amount of heat. The whole thing is simple. (Hmmm, Where did I hear that before?) Get your ingredients to room temperature first. Just melt your butter and chocolate chips in the bowl. 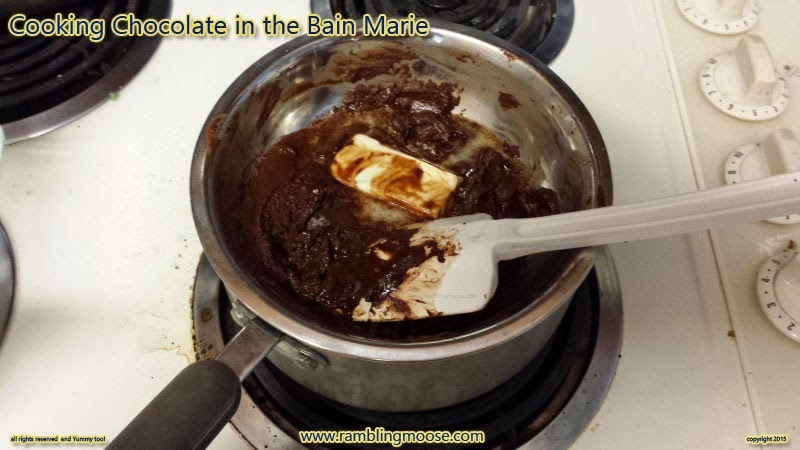 If you are using the Bain Marie, put the butter on the bottom of the bowl so it melts first. Stir it around and when it is smooth and melted, remove it from the heat and fold in the other ingredients. Whisk it smooth, then put the batter in the prepared pan. Preparing that pan made it perfect. Oil the 8 by 8 baking pan. Cover that with parchment paper. I gave the paper a quick once over with some more cooking oil. It all just popped free. Gather all ingredients and get them warmed to room temperature. Oil the 8 by 8 baking pan generously or use non-stick spray. Line the bottom and sides with Parchment Paper. I oiled the parchment paper and the recipe just fell off the paper perfectly. Set glass or stainless steel bowl on top of a simmering pot of water for your Bain Marie. Add Butter, then Chocolate Chips and stir until everything is melted and smooth. Remove Bowl from the Pot and carefully whisk in the sugar and brown sugar. Whisk in or Mix in an egg at a time followed by the vanilla extract and flour. Whisk the mixture until the batter is well combined and smooth. Bake for 35-40 minutes at 350F/180C. It is done when the toothpick can be inserted in the center and comes out clean with few crumbs. Allow the brownies to cool for 30 minutes before transferring to the refrigerator. Allow the brownies to cool in the refrigerator for 2 hours before cutting into pieces and serving. Optionally dust the brownies with confectioner's sugar to serve.